On March 23rd, Ken Sande will be with us to teach key principles of relational wisdom (sign up, pick your lunch). If his name is a new one for you, I'd like to introduce him a bit. You can find out more about him on his ministry website, but here is some of his journey in his own words. By God’s grace, I’ve had the privilege of founding two organizations that are dedicated to preserving and transforming relationships: Peacemaker Ministries and Relational Wisdom 360 (RW360). This March SGC is hosting a one-day seminar by author and speaker Ken Sande. Many of us have read and benefitted from his book, The Peacemaker: A Biblical Guide to Resolving Personal Conflict, and its related materials. This March he'll be speaking on a new series of teachings he's developed on Relational Wisdom. Check out this post for the kinds of questions he'll be addressing. 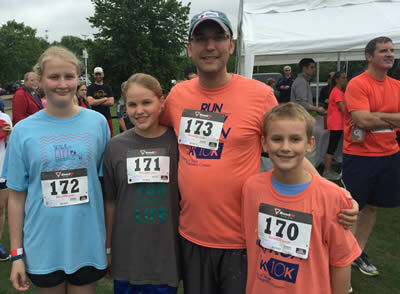 On May 1, despite the threat of rain, Hand of Hope held a well attended Walk for Life and Run, Baby, Run race. This was their eleventh annual walk and second annual race. Many folks from Sovereign Grace attended. If you ran in the race, you can find your results as follows. Thanks to a registration snafu, special congratulations are due to Luke Briley for an impressive performance for a 99-year-old! See below for some pictures from the event. We work hard at things that we think are important. Of course, some of those things simply aren't—at least, not in the larger sense. Fantasy football is underway for many of us, and beating our cousin or co-worker or neighbor feels great in the moment and seems to justify the hours of research we did before making our draft picks. But this probably won't be remembered on our tombstone…even if we win ESPN's bazillion-dollar prize. Sometimes, though, things that really are most important go uncared for. What does it mean that Mike and John will be ordained this Sunday? This Sunday Mike Noel and John McLeod will be ordained as elders at Sovereign Grace Church. But what does it even mean to be “ordained”? Aren’t they basically elders now? What will change after Sunday? We want to take a minute here and think about these questions and a few others. My name is Joy Sasser, and I was one of the 32 from SGC that recently ventured down to Agua Viva Children’s Home in Guatemala. Speaking for the team is tough because everyone took something different away from the experience and of what God did through us and in us. There are a few things I can confidently say from the group. Most of you know that I work for a Christian publishing ministry. It’s called Church Initiative. We make video-based resources that equip churches to help hurting people. Our team recently finished up work on the third edition of GriefShare, a small group, grief-recovery program.